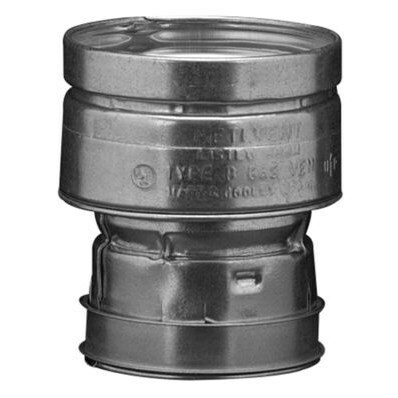 Gas Vent Increaser; Type Double Wall; Larger End Size 4 Inch; Smaller End Size 3 Inch; Length 5-1/4 Inch; Material Thickness 0.012 Inch (Inner Wall), 0.018 Inch (Outer Wall); Material Aluminum (Inner Wall), G90 Galvanized Steel (Outer Wall); Applicable Standard UL; Used On Type B Gas Vent SystemThe Hart & Cooley® double-wall, air-insulated B-Vent system is secured by locking joints . Properly installed, the vent won’t come apart through vibration, and offers protection against vent failure or fire hazard. By using high-quality materials and skilled workmanship, our galvanized outer pipe and aluminum inner pipe provide protection against corrosion and external damage. Hart & Cooley’s simple two step engagement helps installers achieve installation quickly and easily . Simply engage pipe sections and secure by sliding the lock ring over security tabs . This unique system creates a strong connection without the use of screws . With our complete offering of fittings, supports, and caps, Hart & Cooley B-Vent is your most valuable teammate to complete any installation.